Extreme sports has another lifeline in case of disaster. Snowboarders, downhill and cross country skiers, snowmobilers, even mountain climbers now have a very comfortable too to help them survive an avalanche. If the initial tidal wave of snow doesn’t kill them, suffocating while trapped underneath the snow is certain to. Not because there isn’t any air to breathe, but because of a local build up of carbon dioxide that super saturates the area where the victim may be breathing. But the Black Diamond Avalung II uses simple misdirection to change all that. The idea is simple. Breathe in the air that is around you and exhale your deadly carbon dioxide into the Avalung, which then distributes the Co2 away from the “fresh air intake zone,” and gives the survivor more time to wait out rescue. And as a bonus, the Black Diamond Avalung is made of Nylon and flexible plastic making it both light and extremely comfortable to wear. 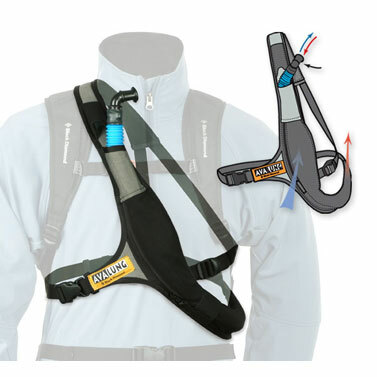 It weighs all of 9 ounces and fits casually as a shoulder sling around the skier’s upper torso. And with a price of under $120 from Amazon, it’s so affordable, that any extreme sports fanatic would rue the day to be caught without it in a worse case scenario. I can’t believe this product made this site! The Avalung product line has been in existence for at least 4-5 years.